Despite the sales increase, incentive spending through the first three weeks of August was $3,744 per unit, down $141 from the same time last year. The decline continues to be driven by reduced spending on cars, down $448, while spending on trucks/SUVs is up $22. “Another month with reduced spending is a positive indicator for the health of the industry, but the continued rise of truck incentives remains a concern,” King said. “As the manufacturers look to clear out old model year inventory, considerable potential exists for spending to rise by the end of the month.” Last year spending over the holiday period rose by more than $200 from the start of the month. 1Figures cited for August 2018 are forecasted based on the first 16 selling days of the month. 2August 2018 and August 2017 both have 27 selling days in the month. The average new-vehicle retail transaction price to date in August is $31,836, an all-time monthly record. The previous high for the month of August—$31,269—was set last year. Average incentive spending per unit to date in August is $3,744, down from $3,886 during the same period last year. Consumers are on pace to spend $41.1 billion on new vehicles in August, which is $1.5 billion more than last year’s level. Trucks account for 68% of new-vehicle retail sales through Aug. 19—the highest level ever for the month of August—making it the 26th consecutive month above 60%. Days to turn, the average number of days a new vehicle sits on a dealer lot before being sold to a retail customer, is 69 days through Aug. 19, down 4 days from last year. Fleet sales are expected to total 216,200 units in August, up 0.8% from August 2017. Fleet volume is expected to account for 14% of total light-vehicle sales, flat vs. last year. 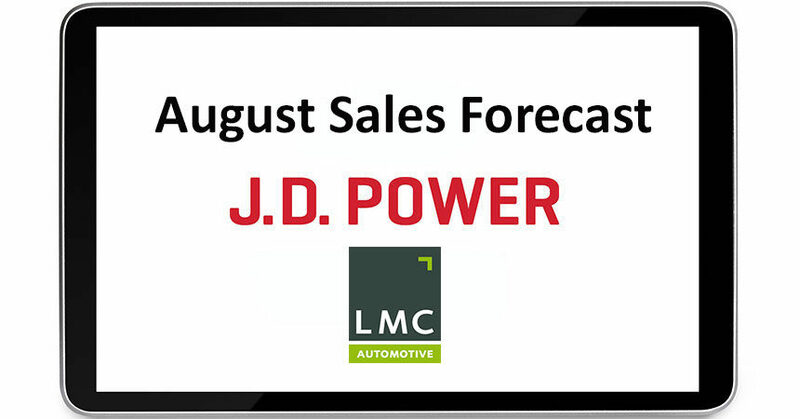 As a result of less restraint on fleet volume, LMC’s base case forecast for 2018 total light-vehicle sales has been increased to 17.2, or 20,000 units higher than 2017. 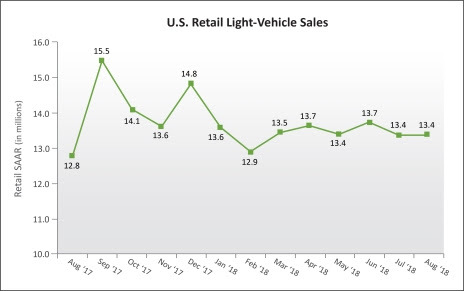 The retail light-vehicle forecast remains at 13.8 million units, a decline of 1.2% from 2017. Fleet sales are forecast now at 3.4 million units, or an increase of 5.7% (185,000 units) from a year ago. Fleet mix of 19.8% is approaching 20% for the first time since 2010. J.D. Power is a marketing, consumer intelligence, and data and analytics company that helps its clients measure, understand, and improve the key performance metrics that drive their growth and profitability. J.D. Power’s industry benchmarks, unique data and analytics platform and reputation for independence and credibility has established the company as one of the world’s most well-known and trusted providers of Voice of the Customer insights. Established in 1968, J.D. Power is headquartered in Costa Mesa, California, and has offices in North/South America, Asia Pacific, and Europe. For more information on car reviews and ratings, car insurance, health insurance, cell phone ratings, and more, please visit jdpower.com/ratings.